Yoga is a powerful tool that can be used to enhance speech, language, and communication development in children. Our different classes are designed to meet the needs of both typicall developing children and those with nuerodevelopmental challenges such as those with language disorders, ADHD, autism spectrum disorders, speech sound disorders. Yoga is also a wonderful medium for teaching other aspects of speech and language development, including language acquisition, vocabulary development, play skills, social skills, self-regulation, and emergent literacy. The Speech Dynamic has combined yoga techniques with speech and language development to develop unique programs for children. These program Brooke’s training as a children’s yoga teacher with her expertise in speech and language development. Concepts related to vocabulary development, literacy, and listening skills can all be embedded into the session in a meaningful and enraging way. Yoga is the perfect context for working on language! By mapping words onto movements, children learn vocabulary and concepts in a multi-sensory way, which promotes long-term learning. Respiration is the foundation of speech. 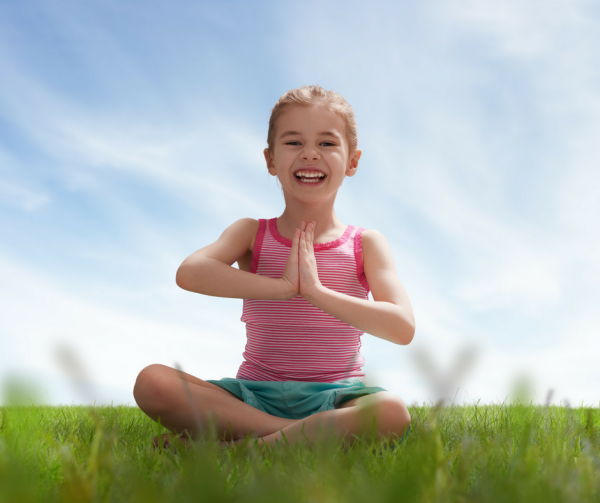 Yoga enables children to become mindful about their breathing. Yoga breathing can support speech production by 1) enhancing awareness of the breath 2) strengthening and elongating trunk muscles for appropriate postural alignment 3) improving control over the respiratory cycle, 4 )increasing the oxygen supply necessary for proper functionign of the body (and brain) ( Fitzpatrick and Longtin, 2017). Yoga supports self-regulation. When children go into “fight or flight,” their brains shut down for learning. When our body and mind are in a relaxed state, we have the best potential for learning and and retaining information. Giving children the tools calm down and self-regulate from a young age supports their learning and helps them handle difficult situations. Through breathing exercises and child friendly meditations and visualizations, children can learn how to relax and calm their bodies. Focusing on breathing can help calm and relax children’s bodies and minds, especially those with ADHD, positively impacting language learning. 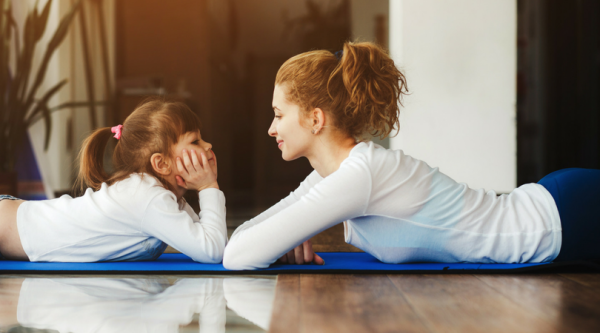 Yoga provides a context for children to practice their play skills, specifically their symbolic play skills, in which one object stands for another. As children pretend to be an insect or a rainstorm, they are using their bodies to pretend they are something else. This is a skills that coincides with language development. During our theme-based yoga classes,children engage in shared imagination. Sharing an imagination an important skills for the cooperative play that emerges around 4-5 years old. Yoga is a wonderful medium for learning skills such as sharing space, taking turns, and controlling our bodies. Lessons such as kindness, friendship, and gratitude are infused throughout our classes. Emergent literacy refers to the reading and writing knowledge and skills that precede and lay the foundation for conventional literacy (Teale & Sulzby, 1986).Yoga classes are language-rich contexts, which can enhance both oral and written language development (Fitzpatrick & Longtin, 2017). Books can easily be incorporated into yoga session, which can increase phonological awareness, alphabet knowledge, and print awareness, all of which are highly correlated with later literacy development. New mothers and babies from six weeks to one year can practice yoga together. These classes focus on prelinguistic skills such as eye gaze, shared attention, and turn-taking. Movements performed during this class, with the help of a caregiver. strengthen the infant’s muscles, improve their digestion, and facilitate sleep. Research indicates that sleep is critical for maturation of the infant’s brain and the integration of their memory networks (Tarullo, Balsam, and Fifer, 2011), When engaged in yoga with their caregivers, infants simultaneous hear words as they experience the movement of poses. This facilitates early comprehension of language. Mom and baby will have the opportunity to bond through poses, songs, rhymes, and movement. 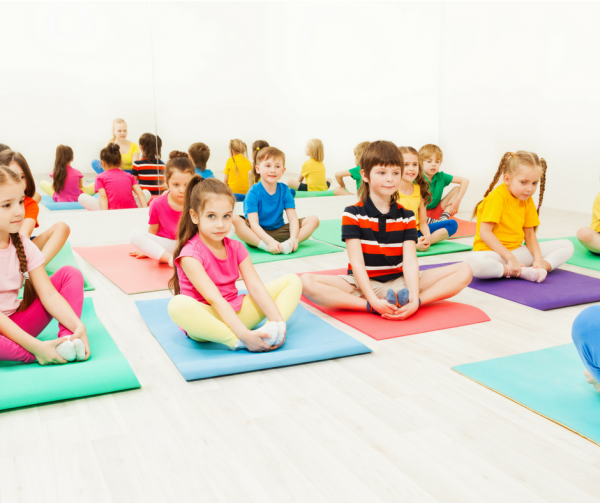 Yoga classes for children of this age include breathing experiences that support speech development, A variety of language-based concepts such as colors, shapes, numbers are embedded into the class. Hearing language paired with movement provides a multi-sensory experience for learning new vocabulary and concepts. While energetic and playful, these classes end with an opportunity for relaxation, which promotes calmness and relaxations. These yoga classes include music, props, and books to lead preschoolers on their yoga journey. Classes are rich with opportunities for pre-literacy skills, including phonological awareness, narrative skills, and alphabet knowledge. Social concepts such as friendship and kindness are explored in this class. The language rich context of a toga class provides many opportunities to learn new vocabulary and concepts. This class ends with a guided visualization, including spatial, temporal,, and descriptive concepts which facilitates speech and language development in addition to mindfulness.